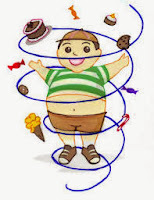 Eating unhealthy foods is one of the top most reasons that can cause obesity in children and teenagers. To efficiently control or prevent obese problem in children, it is very important to make them follow good eating habits. -Sweets, soft drinks and jams can increase weight. So it is advised to reduce or completely avoid these foods. Cool drinks contain phosphoric acid which can also damage teeth and bones. Coloring agents and preservatives in cool drinks can severely affect children kidneys and nerve system if consumed heavily. -Reduce the usage of oils, cheese, ghee and other dairy products in the foods. -Pizza, burgers cakes and other bakery products contain high fat contents. Also these foods do not have fibers in them. So it is strictly advised to avoid these foods as much as possible. -Encouraging children and teens in physical movement activities like gardening, sports can help preventing obesity. -It is also advised to take children for health checkup to find out any thyroid issues that could trigger obesity. The above are few suggestions to control or prevent obesity in children. These are points that also help adults to keep them away from obesity. According to a study 50 percent of adult obesity started in childhood.